Tascam introduces a new portable digital studio in the Portastudio series that records to SD cards, the DP-24SD. IZ Corp will introduce at NAMM 2015 a new version of its Radar digital music production station, which can run any DAW natively. The Audio department at Steven Slate’s announces the release this month of the second version of the software of the Raven multitouch mixing system. Music Computing introduces Modulas, a new modular multitouch digital mixing system included in the MotionCOMMAND Series. Tascam introduces DP-32, a 32 track Digital Portastudio with solid-state recording, a colour LCD display and channel strip controls. iZ Technology Corporation has launched Radar 6 at the 133rd AES Convention in San Francisco. Slate Pro Audio introduces its Raven MTX Multi-Touch Production System at AES. 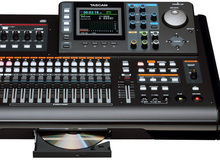 Tascam introduced its new DP-03 8-track Digital Portastudio.